Nichols, J. G. (ed. ), Chronicles of Queen Jane and Two Years of Queen Mary, Camden Society, 1850, rep. 1968. Nichols, J. G. (ed. ), Diary of Henry Machyn, Camden Society, 1848, rep. 1968. R. Tyler (ed. ), Calendar of Letters, Dispatches and State Papers Relating to the Negotiation between England and Spain, 1969-78, vol. 11. Weir, Alison (1996), Britain's Royal Families: The Complete Genealogy, London: Pimlico. ISBN 0-7126-7448-9. Waller, Maureen (2006), Sovereign Ladies: The Six Reigning Queens of England, New York: St. Martin's Press, ISBN 0-312-33801-5. 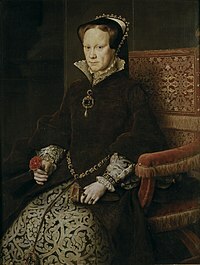 Porter, Linda (2007), Mary Tudor: The First Queen, London: Little, Brown. ISBN 978-0-7499-0982-6. Whitelock, Anna (2009), Mary Tudor: England's First Queen, London: Bloomsbury. ISBN 978-0-7475-9018-7. Duffy, Eamon (2009), Fires of Faith: Catholic England Under Mary Tudor, New Haven, CT: Yale University Press. ISBN 0-300-15216-7.